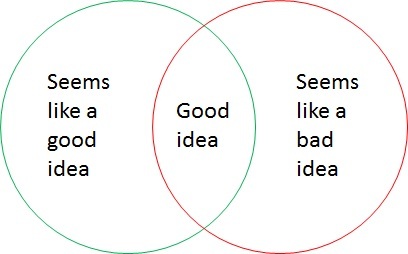 All good ideas are at the intersection of seems like a good idea and seems like a bad idea. Take any really successful company and imagine the pitch they made to the VC. If everyone in the room said it was a good idea likely there were loads of people trying to execute on the same idea. If everyone in the room said it was a bad idea then probably it was close to impossible to execute. But… if you had people on both sides they you might really have something. Twitter sounded stupid, we are going to make a phone app that is just like SMS but better, Instagram, we are going to let people publish pictures after applying a short set of canned filters to the pictures, Facebook we are going to create an online way for college students to meet each other… all of these you can imagine people falling on both sides of the argument, apparently that was a leading indicator. This entry was posted in Uncategorized and tagged Business, creativity, Employment, Entrepreneur, ideas, inspiration, start-up, Venture capital, vision, Work. Bookmark the permalink.